HEALTH BENEFITS – The natural anti-inflammatory and antioxidant properties of our Certified Organic Turmeric supplement have provided relief to many ailments such as Arthritis, Joint and muscle pains as well as enhancing general wellbeing. Furthermore, it has been known to boost the immune system and lessen the risk of infections as well as improving brain functions, namely concentration, cognition, attention span and memory. TURMERIC SPECIALISTS – We specialise in and focus only on Organic Turmeric capsules. We understand the impact ill health and pain can have in your life and have created a supplement which acts as a preventative and curative solution. Our honest and reliable reviews are testament to our mission of “better health for all”. 100% SOIL ASSOCIATION CERTIFIED ORGANIC CAPSULES – Our product is uniquely 100% organic as we only use Organic Turmeric (500mg) and Organic Piperine (10mg – Black Pepper). When taken with black pepper, turmeric absorption is increased by up to 2000% thereby enhancing the benefits of the turmeric. Optimum 500mg Organic Turmeric per capsule as advised by medical professions at WebMD UK. 100% PURE & NATURAL – We manufacture and operate in the UK and our organic turmeric tablets are safeguarded by the highest manufacturing standards in the world (BRC and GMP certified). Suitable for Vegetarians and Vegans. No Artificial Ingredients and additive free. You are receiving a pure, natural, high quality, certified organic product. 100% SATISFACTION GUARANTEED OR YOUR MONEY BACK – We operate a 30 day NO questions asked money back guarantee if you are not happy with your purchase. Great health doesn’t have to be costly. 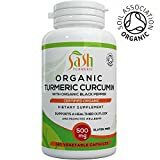 SASH Organic Turmeric and Black Pepper capsules are proudly the original product on Amazon UK certified as 100% Organic by the Soil Association. 100% Soil Association Certified Organic – Your choice should have an organic certified logo on the label to guarantee the pure and natural contents of the product. Soil Association is the country’s leading organic certifier. Optimum Dose – Each capsule should contain 500mg which is the optimum and safest dosage recommended by medical professionals. Organic Piperine found in black pepper to help your body absorb Curcumin which in turn enhances the benefits of the turmeric. Pure and Natural, No fillers, Binders, Bulking agent, flowing agent or Artificial ingredients. They should only contain the pure organic turmeric and black pepper. 100% Soil Association Certified Organic. Added Organic Piperine (black pepper) to increase turmeric absorption upto 2000%..
Optimum 500mg dose as recommended by medical professionals at WebMD UK. Pure and Natural Ingredients – the only thing you’ll find in this bottle is the highest quality Certified Organic Turmeric with Piperine in a vegetarian capsule. No fillers, Binders, Bulking agent, Flowing agent or Artificial ingredients. Suitable for Vegetarians and Vegans as well as Halal and Kosher diets. Sourced from India, so you will be getting the best quality Turmeric. This entry was posted in Buy Supplements and tagged 100%, Absorption, Added, Arthritis, Association, Best, Black, Capsules, Certified, Curcumin, Great, Joint, Made, Natural, Organic, Pain, Pepper, Relief, Soil, Turmeric by TOSMS. Bookmark the permalink.